SEOUL, Oct. 11 (Yonhap) — K-pop boy band BTS has remained on Billboard magazine’s two key charts for the third-straight week, according to the American music publication Wednesday. The band’s EP album “Love Yourself: Her” clocked in at 35th on the “Billboard 200” chart for the week of Oct. 21, according to Billboard’s website. The album’s lead song, “DNA,” ranked 85th on “The Hot 100” chart, which aggregates individual songs. “A Korean-language album remaining on Billboard’s two main charts for three-straight weeks is proof that U.S. fans are consistently consuming music by BTS,” said Big Hit Entertainment, the band’s agency. BTS is the second K-pop act to have a Korean-language song on the Hot 100, following South Korean rapper-singer Psy, whose smash hit “Gangnam Style” peaked at No. 2 for seven weeks in 2012. 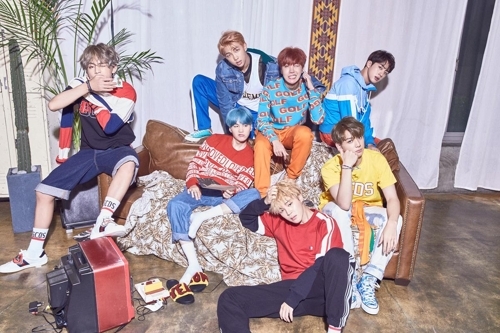 The seven-member act will end its media publicity for “Love Yourself: Her” on Thursday after appearing on “BTS Countdown” on the music channel Mnet.